"When your cruise docks in the Katakolon port, take a private shore excursion to Olympia, where youll discover its famous archeological site on a walking tour. 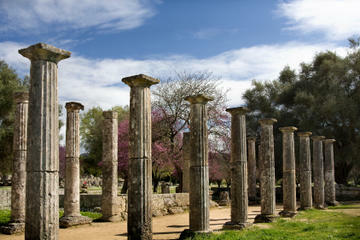 Ancient Olympia is the sanctuary of ancient Greece, where the classical Olympic Games were held. See the remains of the original Olympic stadium, the Bouleuterion and the Temple of Zeus. Enjoy free time in modern Olympia to shop or visit the Museum of the Olympic Games. As you explore with your private tour guide, you are sure to make the most of your time in port and have a memorable, personal experience. the games continued until approx. 394 AD when Emperor Theodosius I abolished them because he considered them reminiscent of paganism. Follow your local guide through the site, listening to interesting facts about the area. At the UNESCO World Heritage-listed Archeological Site of Olympia, marvel at the Temple of Zeus, which once housed the gold and ivory statue of Zeus, one of the Seven Wonders of the Ancient World. This site was also the home of the original stadium and the Bouleuterion (the administration building). Today, you can see the Bouleuterion remains as an early Greek temple with a square horseshoe shape and tiered seating arrangements. Then enjoy an hour of free time in modern Olympia to shop or relax at one of the numerous cafes. Wander around the town hall, designed by the renowned Greek architect Aris Konstantinides, or visit the small Museum of the Olympic Games.